Witcher 2 Combat Overhauled But Not "Dumbed Down"
Tomasz Gop of CD Projekt Red recently showed off the overhauled combat system in the upcoming Witcher 2, saying that while it's dramatically different than the first game it hasn't been "dumbed down" in any way. The combat system in The Witcher was unusual to say the least, relying on a mix of styles, weapons and combos, backed up by potions and magical powers. Its hallmark was the rhythmic mouse clicking needed to build combos; good timing would turn you into an unstoppable dervish, whereas with bad timing you were more likely to just poke yourself in the eye. That system is gone but the "fast" and "heavy" attack styles remain, this time mapped to the left and right mouse buttons to allow for switching between styles on the fly. Geralt will also rely more heavily on signs, the rudimentary system of magic used by Witchers, and will be able charge and aim his magical attacks. Unlike the first game, weapons other than the steel and silver Witcher swords will actually have a use and Geralt will be able to focus his training on weapons other than that traditional pair. "The combat has absolutely not been dumbed down," Gop said. "Nor has the game been consolized." Poker dice and fist fighting for money will remain in the new game, although they've been tweaked to feature quick-time events and physics, and a new arm-wrestling mini-game has been added. Geralt will again have to contend with "romantic entanglements," and at least one other character - the bard Dandelion - will be playable for part of the game as well. Gop estimated that the game will weigh in at around 40 hours and will have 16 "states" in which the game can end, ten based on major plot points - the death of a companion or the destruction of a nation - and six based on relatively minor details. Whether The Witcher 2 will make its way to consoles remains an open question, as Gop would say only that CD Projekt would "like to see it happen." The new game will support controllers, however, so from an interface standpoint it doesn't appear to be out of the question, but for now it remains a PC exclusive. 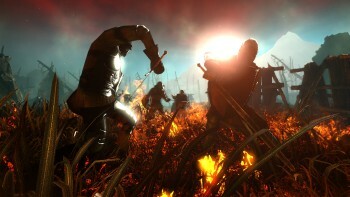 The Witcher 2 comes out on May 17.